With a plethora of eating options at local farmer’s markets, I decided to try Matties Wood-Fired Pizza. With most ingredients grown locally, including dough made fresh each day, the thin-crusted pizza’s aroma lured me to join the food trailer’s queue. With farmer’s markets springing up all over Fresno County in recent weeks, I joined the crowds in Old Town Clovis for the weekly summer street market. While I initially wasn’t planning to eat dinner, my family and I stopped in front of Matties Wood-Fired Mobile Pizza Oven. The smell of freshly baked dough and local ingredients wood-fired in an Italian-made oven stopped me behind a queue of five patrons. I have often joined the community bandwagon and eaten at local CartHop Fresno events, so pausing to watch my personal-sized, 14-inch, wood-fired pizza bake was a no-brainer. Cost? $6-8. Owner Matthew (Mattie) Wolcott was kneading dough into thin crusted personal pies. 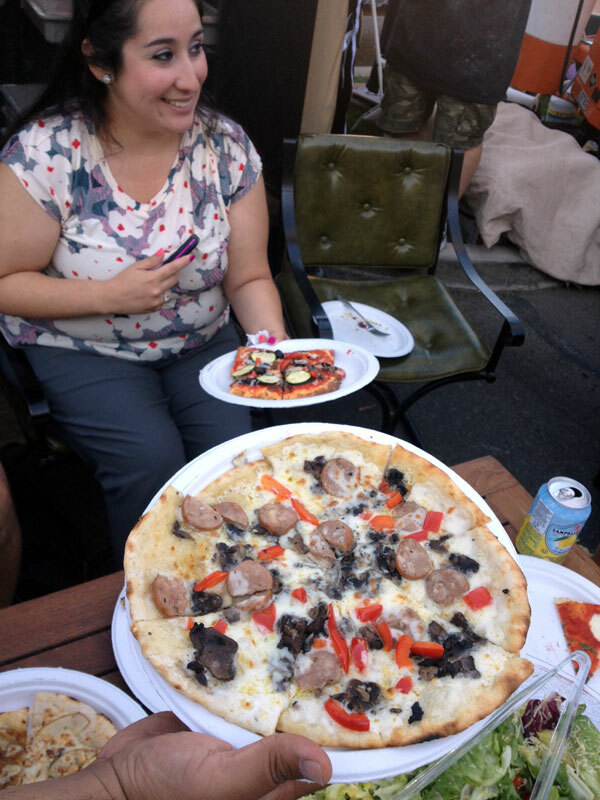 The menu included up to 12 varieties of Neapolitan-inspired pizzas (VIDEO). My first taste of Matties Wood-Fired Pizza was split with my twenty-something daughter, Brittany. We decided to share two pizzas: 1) Pizza Vera: caramelized onions, fresh thyme with Maytag blue cheese and Enzo olive oil; 2) Mattie’s pistachio pesto pizza with fresh mozzarella, San Marizano tomatoes, and bacon. Owner/operator Matthew (Mattie) Wolcott left the education field to pursue Italian cooking, dreaming to cook and entertain with an authentic Italian oven. The pizzas came out piping hot. The mozzarella bubbled and the bacon’s aroma melded with the smokiness that one only gets when the BBQ cooks with almond and/or fruit wood. The freshly ground pistachio pesto was brilliant on the slightly charred, crispy crust, adding texture to the pizza. The tomatoes? Well, they were fresh, ripe, red, halved and full of flavor. Mattie said his favorite pizza is the Vera. I concur. I’m a caramelized onion fan as well. That may be due to my own extensive time in the kitchen. The pizzas did not last long as we chowed down on the sweet and savory flavors. Matties is gourmet pizza at its best. I must admit I longed for a glass of Paso’s Tablas Creek Estate Rosé, Santa Ynez Valley’s 2009 Martian Vineyard Grenache Rosé, Villa Creek’s Pink, Caliza Winery’s Pink or other Rosé alternatives. However, the wine or beer option is only available for those who attend one of Matties weekly private parties. A bottle of iced water filled in just fine this time as June in the Central Valley heats up. I shared two pizzas with my daughter 1) Pizza Vera: caramelized onions, fresh thyme with Maytag blue cheese and Enzo olive oil; 2) Mattie’s pistachio pesto pizza with fresh mozzarella, San Marizano tomatoes, and bacon. After working in the performing arts field for four years, Wolcott (43) taught elementary school for two years before becoming a consultant for a publishing company in the Bay Area. He served as a local rep. selling textbooks and later led a charter school for three years. However, by 2010, he grew dissatisfied with his role in education. However, despite his career choices, he has always had a interest in cooking. In fact, Wolcott used to watch the 1980’s PBS show, Ciao Italia, with Mary Ann Esposito and still follows it when he can. The wood-fired oven stone floor is kept at 750 degrees. The beauty of a wood-fired oven is that its high temperature ensures the crust will not be soggy and radiated heat cooks the top ingredients in about two minutes. “I’ve stuck with Italian for most of my life and so I felt it was time to strike out on my own, sharing my passion: wood-fired pizzas. I just wanted to cook. So I worked with someone in the Bay Area and began catering for two summers while I still was in education. 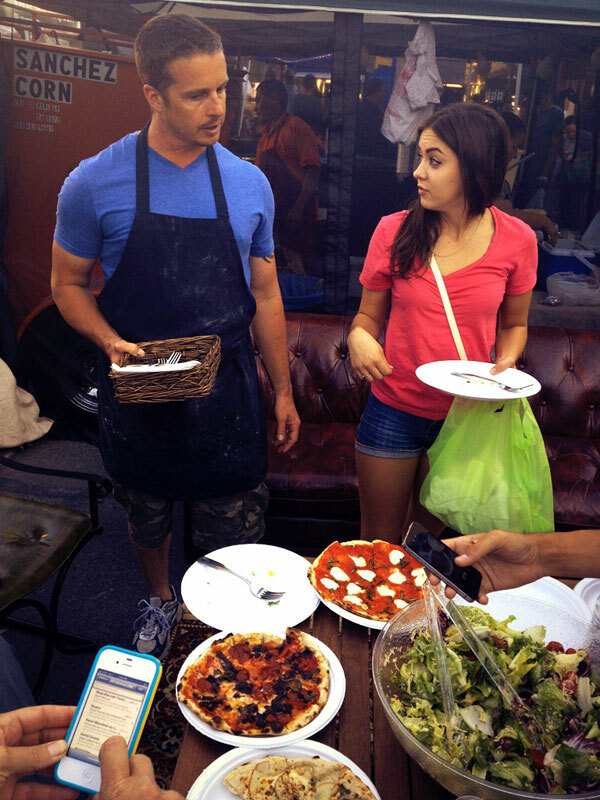 That became the impetus for me to get a food trailer and begin making pizzas on my own almost three years ago. Matties Wood-Fired Pizzas start with fresh pizza dough made from scratch using Giustos flour out of South SF because it was recommended by a cooking school in Healdsburg. And while fresh local ingredients most often make a tremendous difference in culinary presentation, Wolcott believes the wood-fired oven changes everything. Matties Wood-Fired Pizza can create 12-15 different pizzas and can be found at the local CartHop events, farmer’s markets and private parties. 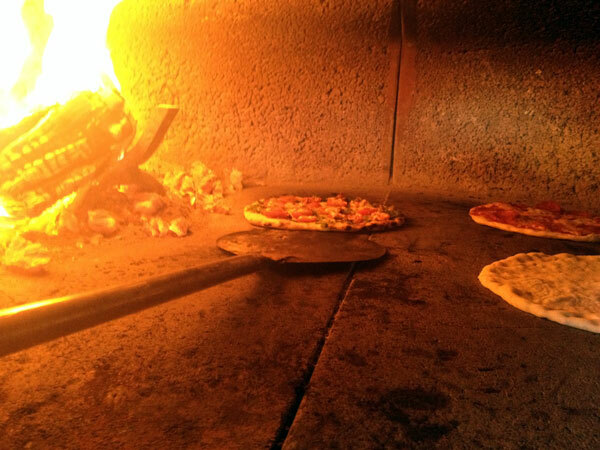 The wood-fired oven’s stone floor is kept at 750 degrees and takes about two hours to reach that temperature. The beauty of a wood-fired oven is that its high temperature ensures the crust will not be soggy and radiated heat quickly cooks the top ingredients. The average time for a pizza in the oven is about 2-2.5 minutes. Matties factoid: Mattie Wolcott’s favorite pizza is caramelized onion and blue cheese with thyme. He says it is great with a salad. He also says pizza lovers might try a bubbly Lambrusco Le Grotte white wine on hot summer days. However, when he was pressed, Wolcott said he was mostly a red wine drinker. His favorite is/was the Jordan Winery ’95 Cabernet. However, he went on to say that he is not a traditionalist to wine choices with food. Currently Wolcott is relying on referrals to build his pizza-loving clientele and has only used one postcard mailing. 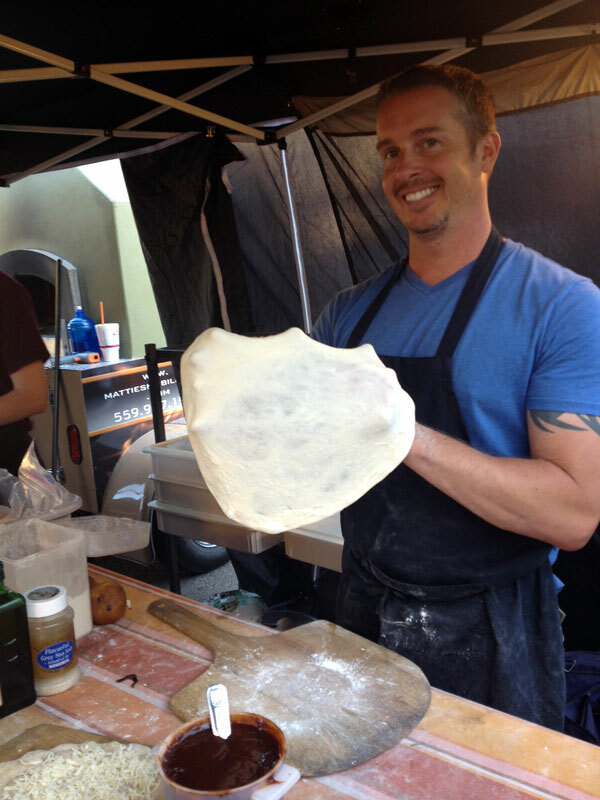 His team uses a trailer equipped with a Mugnaini Italian oven and an enclosed tent to create the pizzas. His goal is to add a second mobile oven on a 20-foot trailer with a full kitchen. He plans on joining the other food trucks at events, including weekends at Bella Frutta. Matties Wood-Fired Mobile Pizza Oven is a wonderful food alternative for those stopping for lunch/dinner at local farmer’s markets, a family reunions/gatherings, graduation, weddings, corporate parties/events, bridal rehearsal parties, baby showers and graduation parties. It reminds me of homemade Italian pizza. Mattie’s has set up for oven-fired pizzas in backyards for small parties to large events at wineries. All they need is about three-four hours of prep. time before each event and an approximate number of guests. Each event may have additional costs, but Wolcott said a flat $350 fee would cover about 25 guests with each additional pizza eater rate at $6-8 for a 2-4 hour event. 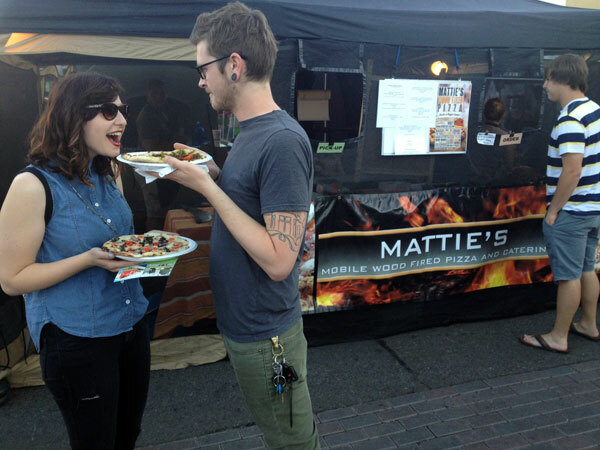 Matties will serve up to five pizza varieties at an event. The Alfredo sausage pizza has tomatos, Tuscan pork sausage, mixed mushrooms on an alfredo base. On a typical day, Matties will wood-fire 100-200 pizzas but will increase those numbers for larger events. They have 12-15 different varieties. Monday: Site views/visits to map out area for private parties. Food offerings include but are not limited to wood-fired pizza, salad, dessert (berry crisp) biscotti, pasta bars, dinner party appetizers, roasted egg plant, arugula goat cheese, butternut squash, etc. Tuesday: River Park Farmer’s Market, 5:30 – 9 p.m.
Thursday: CartHop Fresno, Fulton Mall, 11 a.m. – 2 .pm. Friday: CartHop Fresno, Eaton Plaza, 11 a.m. – 2 p.m.
Friday: Downtown Clovis Farmer’s Market, 5:30 – 9 p.m. Finally, in an effort to increase business, Matties needs a bigger trailer. He is hoping that through social media, referrals and a Kickstarter account , a new $40,000, 20-foot trailer can be built by the end of 2013. Wolcott said he has already contacted West Coast Trailers in Madera for the specs. on a new trailer. So through the Twitter, Facebook and Instagram social media, referrals and repeat customers, Wolcott is hoping to grow his business just a little more with a Kickstarter account. He said he felt awkward to ask people for money–even weird. However, this is an avenue he felt his supporters might consider. So if you are inclined to foster a home-grown business, #BeABacker: Mattie needs a bigger home. For more information on Matties Wood-Fired Mobile Pizza Oven, call Matthew Wolcott at 559.917.1969 or email him at mattiesmobileoven.com. He can also be reached through Twitter: @MattiesPizza. For more information on the Fresno’s food truck growth, including Matties Wood-Fired Pizza, watch the video, CartHop: Moving Food Forward by CreativeFresno559. 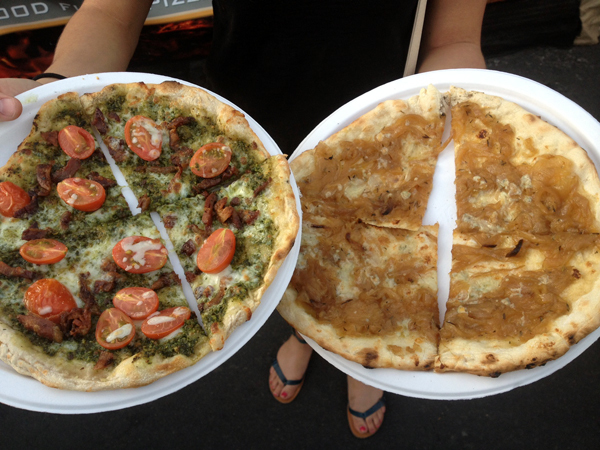 Also be sure to read my Feb. 11, 2013, post: Bella Frutta hosts food truck hub each weekend. NOTE: After struggling through illness during the winter, I am refocused and determined to restart TalesoftheCork on a weekly basis. Thank you for returning and a hearty cheers to you.